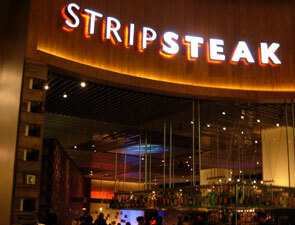 Stripsteak "New American Steak House"
Michael Mina's first steakhouse, Stripsteak, has made a huge splash on the Las Vegas Strip. Opened in partnership with Andre Agasse in 2006, this sophisticated 8,000-square-foot steakhouse is situated within the sprawling Mandalay Bay Resort. 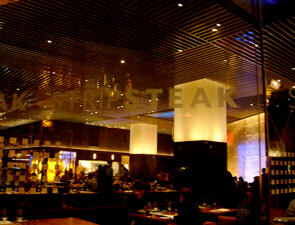 Lively music, unique lighting, lots of glass and plenty of wood provide for an elegant take on the typical steakhouse. This is not your old-fashioned steakhouse; instead, this beef bistro is completely updated and totally hip. And if you're not a beef-eater, don't worry about its name, as Stripsteak serves plenty of the fabulous fish for which Michael Mina is known. There's something here to please everyone in your party. Note: During dinner, between 4:00 p.m. and 5:30 p.m., and between 10:30 p.m. and 12:00 a.m., the lounge offers a full menu. Dress Code: Business casual; although shorts and jeans are allowed, beachwear is not.